Well built and economical nylon shell rope bag. Outside zippered pocket, web handles and release snap. 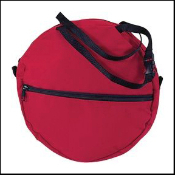 Unlined, 12" diameter, available in solid colors: red, black, or blue.